I am truly grateful you meet me here each week to learn about ways to live a healthier life. Your loyalty does not go unnoticed nor is it unappreciated. 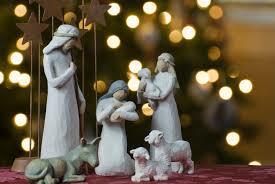 Christmas is such a holy and beautiful day – when we celebrate the birth of our Lord and Savior Jesus Christ. He is, after all, the Reason for the season! Precious Lord Jesus, Light of the World, as we celebrate your birth today, may we begin to see this world through Your eyes. As you chose the lowly, the outcasts, and the poor to receive the greatest news the world had ever known, so may we worship you in meekness of heart. May we also remember those less fortunate than ourselves in this season of giving. Thank You for the gift of Your love. Make me a shining example of that love to everyone I meet. Amen. I wish you blessing upon blessing this holiday season. This can be a stressful and difficult time of year for many emotionally. If that is your experience of the holidays, here are several very effective energy psychology tools to help you reprogram yourself to these stressors, which are magnified at this time of year. Prayer is the first and foremost tool available to each and every one of us. Here is another resource to help you in your prayer life. The Healing Code Book; the Healing Codes system; The Tapping Solution book. This entry was posted in Overall Health and Wholeness, Soul Health, Spiritual Health and tagged Christmas, emotions, energy medicine, prayer, sadness, stress. Bookmark the permalink. 6 Responses to Healthy Holidays: Merry Christmas! Thank you for this beautiful prayer and the prayer journal (which I hope to look at soon). Thank you Ann! Merry Christmas, and wishing blessing upon blessing to you and yours this holiday season as well. Ah thank you my friend!! Thank you, Ann, for the beautiful prayer. Blessings for Christmas and the new year! I get so much from your posts. Thanks for keeping us informed about our health. Debbie I so appreciate your encouragement. Thank you as always for reading and commenting.